05/04/2013 - Costa Rica has deposited its instrument of ratification of the Convention on Mutual Administrative Assistance in Tax Matters, the most comprehensive multilateral agreement available for tax-cooperation and exchange of information. The Convention was developed jointly by the OECD and the Council of Europe, and has been open to all countries since 1 June 2011. It helps counter cross-border tax evasion and ensures compliance with national tax laws, while respecting the rights of taxpayers. G20 Leaders strongly encouraged all jurisdictions to sign the Convention at their Los Cabos Summit in 2012. 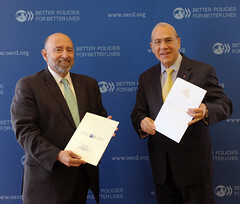 Costa Rica is strengthening its engagement with the OECD including in the area of taxation. “Costa Rica continues to make good progress in transparency and exchange of information”, said OECD Secretary General, Angel Gurría. “Ratifying the Multilateral Convention represents another important step forward. I congratulate Costa Rica for being the first country in Central America to ratify it and I hope other countries in the region will follow their lead”. The Convention is a global instrument for international tax co-operation and exchange of information. It provides a multilateral basis for a wide variety of administrative assistance, including information exchange on request, automatic exchange, simultaneous tax examinations and assistance in the collection of tax debts. The Convention will enter into force for Costa Rica on 1 August 2013. Current signatories to the amended Convention are: Albania, Argentina, Australia, Belgium, Brazil, Canada, Colombia, Costa Rica, Czech Republic, Denmark, Finland, France, Georgia, Germany, Ghana, Greece, Guatemala, Iceland, India, Indonesia, Ireland, Italy, Japan, Korea, Lithuania, Malta, Mexico, Moldova, Netherlands, New Zealand, Norway, Poland, Portugal, Romania, Russia, Slovenia, South Africa, Spain, Sweden, Tunisia, Turkey, Ukraine, United Kingdom, and United States. More countries are expected to sign the Convention and deposit their instruments of ratification at a ceremony to be held in Paris during the last week of May which is when the OECD holds its annual Ministerial Council Meeting, its Forum (http://www.oecd.org/forum/home) and the 5th International Forum on Latin America and the Caribbean (http://www.oecd.org/site/lacforum).